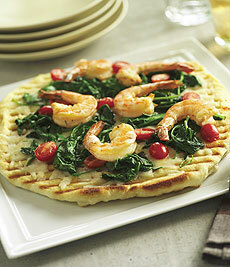 Succulent shrimp and stir-fried spinach and tomatoes turn this ordinary pizza into an extraordinary grilled feat. Photo courtesy J.M. Smucker Company. This grilled pizza recipe was a finalist in the 2009 Crisco Grilling Hall Of Fame Contest; contestants used Crisco No-Stick Cooking Sprays to grease their grills. You can read more about the contest on Page 1. This is Page 14 of a 15-page recipe series. Click on the black links below to view the other recipes. This stylish presentation doesn’t look like a traditional pizza. Part of the fun is seeing how different people will eat it. Some may cut up the shrimp and then quarter the pizza into traditional slice; some may cut and roll a wedge. It’s pizza freestyling! Makes 3 individual pizzas. Spray grill with olive oil no-stick spray and light grill. Pre-heat grill temperature to approximately 400°F. Spray a wok with olive oil no-stick spray. On your stovetop or the grill, sauté spinach and garlic with a pinch of salt and pepper until wilted. Remove spinach from wok and spray wok with olive oil no-stick spray. Add tomatoes and cook for 2 minutes. Put in aluminum foil until ready to use. Spray shrimp with olive oil no-stick spray and season with salt and pepper. Grill shrimp until done, about 2-3 minutes. Cover with aluminum foil until ready to use. Slide a pizza peel (or spatulas) underneath to loosen the dough and to check for doneness. The dough may start to bubble. If it does, pop the bubbles with a fork. There should be grill marks on the dough, just be careful not to over-cook. The dough should be firm, just starting to turn color. Using your peel or spatulas, remove the dough from the grill and flip it over onto a piece of aluminum foil, cooked side up. Coat the top of the dough with more olive oil no-stick spray, then layer the cheese first, followed by the spinach, tomatoes and shrimp onto each pizza. Don’t go crazy with toppings or the pizzas will get too heavy. Slide a floured peel under your pizza and place it back on the grill, uncooked side down. Cover the grill immediately. It’s done when the underside of the pizza is golden brown and the cheese is melted and bubbly. Serve immediately.